A major flood event occurred in 2014 leading to the highest recorded water elevation, 906 feet, on Prior Lake since the outlet system was first installed. During the 2014 flood the outlet channel functioned properly, while continuously receiving water from the elevated Prior Lake. Water rushed through the Channel at a rate and volume never experienced before. This extreme water velocity coupled with the duration of rainfall events caused significant damage throughout the Channel. 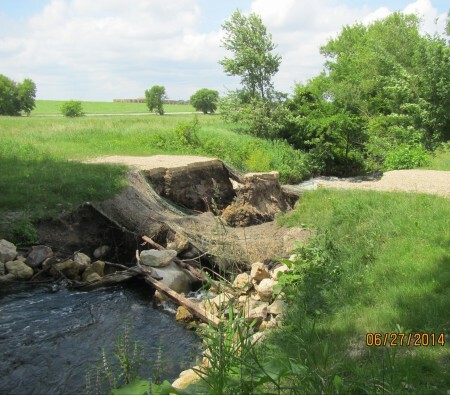 Trees fell, sediment was distributed, and over 20,000 feet of bank erosion occurred. There are 37 property owners along the PLOC. The District is committed to keeping residents informed throughout the repair process. To achieve this goal, an education and outreach plan has been created for the outlet channel. Landowners will receive technical information and timely updates on repair work. They will have opportunities to share their experience and provide feedback. The District has Andrea Slotke, Minnesota GreenCorps Member, coordinating this effort. Feel free to contact Maggie Karschnia, Water Resources Project Manager, at 952-447-9808 or mkarschnia@plslwd.org with any questions or concerns about current or upcoming work on the outlet channel. Culvert replacements will be the next phase of repair work to be expected. Three culverts will be repaired or replaced in order to support flow of the outlet channel. The project is expected to begin in the summer of 2016. Impacted landowners will be contacted individually with a more exact timeline, when this becomes available. One of three culverts to be repaired. Tree and woody debris removals were substantially completed on January 27, 2016. 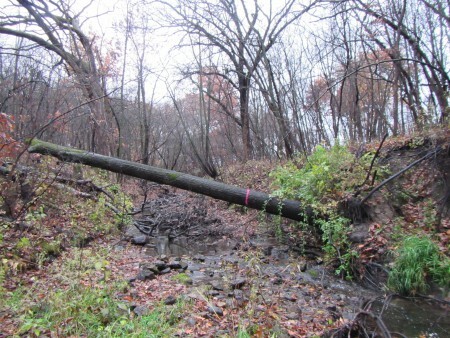 Wetland Habitat Restorations, LLC (WHR) removed downed trees and woody debris from the PLOC in areas where it was blocking flow and/or destabilizing banks. Ongoing work includes restoration on a few segments of the outlet channel. Damage to outlet channel before tree removals.